Heroes and monsters clash with government forces in an apocalyptic London. Two years after London is struck by a devastating terrorist attack, it is cut off from the world, protected by a large force of soldiers (known as Choppers), while those in the rest of Britain believe that their ex-capital is now a toxic, uninhabited wasteland. Jack and his friends know that the truth is very different. The handful of survivors in London are developing strange, fantastic powers. Evolving. Meanwhile, the Choppers treat the ruined city as their own experimental playground. Jack's own developing powers are startling and frightening, though he is determined to save his father, the brutal man with a horrific power who calls himself Reaper. Jack must also find their friend Lucy-Anne, who went north to find her brother. What Lucy-Anne discovers is terrifying-people evolving into monstrous things and the knowledge that a nuclear bomb has been set to destroy what's left of London. And the clock is ticking. Tim Lebbon set the stage for Lucy-Anne and Jack's frighteningly supernatural version of London in London Eye. He drew us in with a chilling premise and excellent execution of a city come undone. Fans of the Toxic City series will revel with its latest installment, Reaper's Legacy! 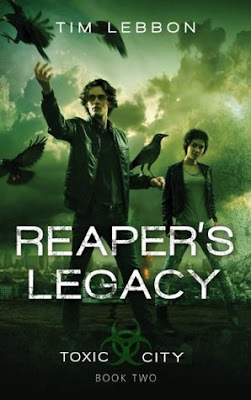 Reaper's Legacy is a grand extension of the first novel. The plot presents so many changes in the characters and the city itself. Lucy-Anne is following the enigmatic Rook to the North in search of her last familial connection. Rook, a mysterious character who also has a story of deep loss, fits in perfectly. I'm actually quite excited about Lebbon expanding his character because he adds a dark intensity to an already attractive set of characters. On the other side of London, Jack faces his own moving challenges along with Sparky and Jenna. The effect of Jack having been touched by Nomad begins to reveal that he's physically changing. Jack is coming into his own supernatural power, more than one it seems. While the Irregulars are dying from a suspicious sickness, Jack is bent on reaching out to his Superior father, Reaper, to implore that he join forces with Irregulars. The main goal is to save his mother and sister while bringing peace to the toxic city. Lebbon has truly outdone himself. The pacing, tone, and style of the novel is consistent, but the plot will truly captivate readers. Lucy-Anne's prophetic dreams are brought into greater focus while Lebbon begins setting up a very explosive future for the series. While Lucy-Anne's side of the story is left clouded in obscurity, readers will end the story with something to ponder over until the third book in the series, Contagion. The fate of Lebbon's destroyed London is going to be even worse, but there's no predicting the events to come. Reaper's Legacy proves itself to be just as ingenious and intense as London Eye, perhaps even more so! No doubt, every reader who picks up this series will be gripped by it's adventure and dark mystery.